Executive Club is the frequent flyer program of British Airways, a Oneworld member. British Airways is one of the few airlines that flies to all corners of the earth. Reward flyers enjoy the generous amount of reward inventory released through Executive Club redemptions. British Airways Executive Club uses a point currency they call Avios. The Avios currency is earned and redeemed like any other frequent flyer program's points. 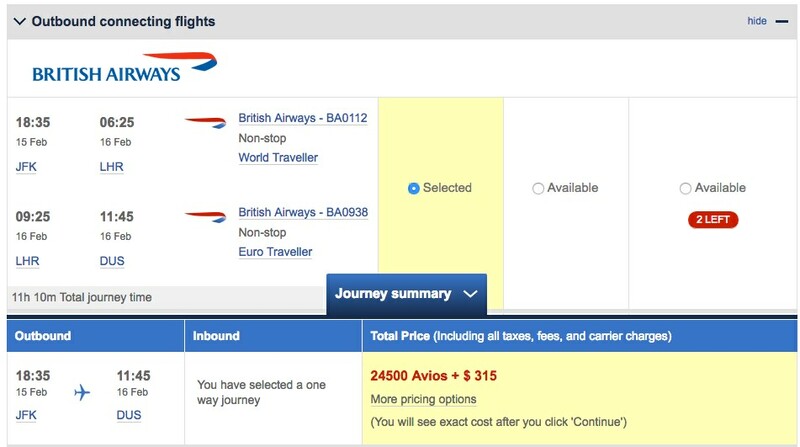 British Airways uses a distance calculation for Avios redemption amounts, as opposed to the more common region based calculation. In addition, British Airways does not publish a reward chart. 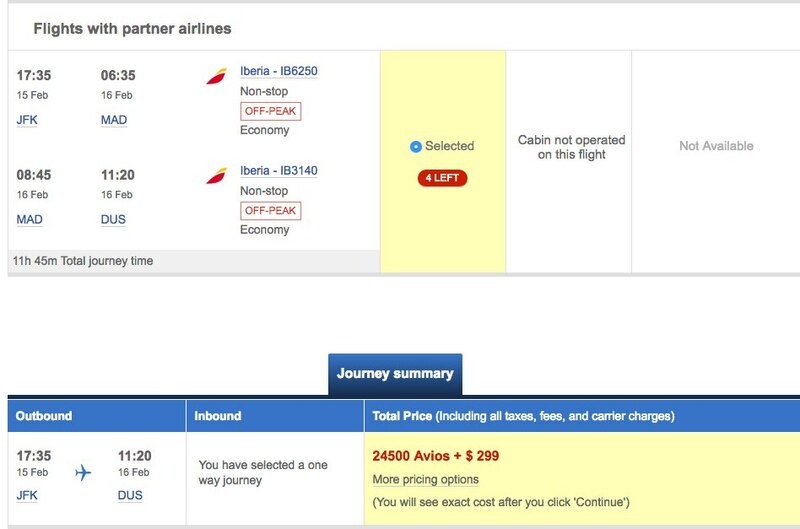 The BA website has an Avios Reward Flight Calculator, which you may use to determine most itineraries. This calculator will show Avios and taxes as well as the option of Avios and taxes plus Money (buying Avios) which is explained in detail below. Another unique feature is how they compile Avios totals for itineraries with connections. British Airways treats each flight as an individual reward ticket. Rule one when looking for an Avios redemption is to find the most direct route possible. British Airways has two reward categories. One that may include British Airways and/or a single Oneworld partner. The second a chart that reflects flying on two Oneworld partners. Both are distance based. Additionally British Airways charges significant surcharges and passes on all partner surcharges to Avios redeemed reward tickets as well. The British Airways chart features an Off Peak reduced redemption as well as a Peak redemption. The Off Peak dates are for the most part randomly assigned with the exception that apparently traveling on Tuesday or Wednesday usually falls into the Off Peak days. Be sure to check the current off peak calendar when considering a reward ticket using Avios. While the additional cost from Off Peak to Peak is generally around 15%-20% more Avios, if you are flying Economy or Premium Economy and the trip is 3,000 miles or more, the Off Peak to Peak increases dramatically. The difference now becomes about 53% more Avios. An example of how you want to make sure you find the most direct route is this example when traveling from London to Omaha. Oneworld has major international hubs in Chicago and Dallas. Both American and British Airways fly to these hubs. London to Chicago is 3.953 miles placing the route in Zone 5, Chicago to Omaha is 416 miles for a Zone 1 fare. The total therefore is 20,500 Avios for this route. London to Dallas is 4,750 miles or Zone 6 and Dallas to Omaha is 583 miles staying in Zone 1 for a total 23,750 Avios. Therefore going with a Dallas connection costs 3,250 more Avios or 16%. If the calculation was point A to point B, like Asia Miles, then the distance is 4,284 miles or Zone 6 fare totaling 16,250 Avios. Unless you live in a city that doesn't require a connection, using Avios can get unfairly expensive. This of course applies to the other side of the pond as well. If you aren't traveling to a major city that can be flown direct, connections can become expensive. This itinerary from Chicago to Helsinki requires 19.500 Off-Peak Avios when traveling on British Airways through London. The total mileage for the route is 4,436 placing it in Zone 6, but due to the connection rules you are paying for a Zone 7 route. Even more disappointing is you can't book the direct Finnair ORD-HEL route using Avios, only Finnair European routes can be booked. This is an example of three Oneworld options flying from New York to Dusseldorf on the same day. The first is airberlin which is non-stop at 20,000 avios plus $5, British Airways via London for 24,500 Avios plus $315 and Iberia via Madrid for 24,500 plus $299. A second more obscure reward chart is used when flying two or more Oneworld carriers and not British Airways. When using the British Airways search engine you will mostly find British Airways flights. If you are looking for partner flight availability it's best to search using at least one hub. For example searching from Darwin Australia to Perth most likely won't get you any results. But search Darwin to Sydney and Sydney to Perth and you will see results on Qantas if available. This applies to North American cities as well. Just make sure one of the cities that is an origin or destination is served directly (or a hub) by the carrier prominent in the region you are flying to. Avios can be valuable when used on short hops as well as multi-carrier long hauls, like a round the world trip. Below under Sweet Spots are some great round the world savings ideas. While it is customary for reward tickets to have airport departure taxes payable, the carrier imposed charge and fuel surcharge are what makes British Airways Executive Club program one of the more expensive frequent flyer programs in the skies. In order to understand what charges you may incur it is easiest to see using the ITA Matrix Airfare Search product from Google. This free website will take your route and find the appropriate carrier's fare structure so you can view the extra costs involved in ticketing. This is exactly what they charge you on the reward redemption. (A premium class ticket is has a $428 YQ surcharge making that ticket $170 more expensive.) So to take the guesswork out of surcharges, for any carrier redeeming Avios, use the ITA Matrix to calculate the amount. British Airways has reasonable fees for reward ticketing. Executive Club Gold members have phone booking and service charges waived. When changing dates for a reward ticket booked on a Peak date to an Off-Peak date, the different in Avios is refunded. Opposite changes from Off-Peak to Peak must be completed through the Executive Club Service Center. Route changes may be made as long as the same number of Avios are required for the new route. Changes of service class are allowed with payment or refund of applicable Avios. When using Avios and Money changes to route are not permitted as well as taking a different Avios/Money options that were offered at the time of ticketing. If you change dates incurring an Off-Peak/Peak situation, you will not be refunded any money if there is a negative difference, however you will need to pay the increased difference if any. Rewards may be cancelled a minimum of 24 hours before departure and receive a full refund. Cancellations within 24 hours of departure forfeits the Avios unless an "Event Beyond Your Control" can be established. 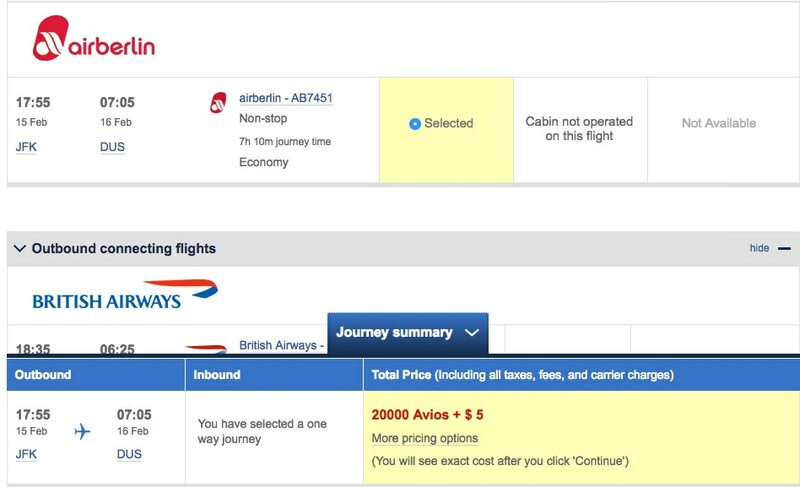 When securing a reward ticket British Airways will offer a Cash and Avios option. Basically this is a way to purchase Avios. You can purchase 30,000 Avios a year, however using Cash and Avios can increase this maximum significantly. The options for Cash and Avios allow up to 50% of required Avios to be purchased. There are usually 5 tiers you can choose from with the maximum 50%. Price for each Avios is typically about 2.8 cents. But you need to do the math as I've found inconsistencies in a just a small sample. The first tier seems to always be around 3.1-3.2 cents per Avios. The rest typically are 2.8 cents. I did find an anomaly where the 3rd tier was 3.1 cents, so you want to do the math. Dollar difference / Avios difference. Whether or not 2.8 cents per Avios, or any frequent flyer point, is worth that price depends on the value of the reward you are redeeming and the number of points you have . Since each flight equates to a reward redemption for that distance, the only reason to combine flights on the same ticket is for luggage transfer and eliminating the need to check in for each connecting flight. So if you are traveling from point A to point C and need to pass through point B and don't want to claim luggage and re-check it or check-in for the next flight, get a reward ticket from A to C. However, if you want to spend some time at point B, you can do so at "no extra charge". When searching for a reward ticket on BA's website you will often get a screen asking if you want a stopover. For example if you are going direct to London from North America you may get the option of a stop over in Paris, even though you might transit London on the way to your "free" stopover in Paris. If you choose it your reward ticket will price based on all the flights. Layovers, Stopovers and Open Jaws are not meaningful to reward tickets in terms of cost. However there may be some cash tax and fee differences depending on how the fares are structured. An Executive Club member may create a Household account where up to 7 family members living at the same permanent address may join. Each member can earn an use Avios on their own, however the household account can pool Avios to secure a reward for a designated member. See British Airways terms and conditions for details. An Executive Club member may secure a reward ticket for any individual with proper identification. British Airways Avios expire after 36 months with no activity in account. Any activity extends another 36 months. To search for rewards on britishairways.com click on the Executive Club tab and select Spending Avios. Then under reward flights click on Book a reward flight. At this point you will need to log-in to your account which is necessary to search for reward flights. If you don't have an account it's instant sign-up and free. Enter the cities, dates, class and other particulars and click get flights. If your itinerary is not between hubs, due to the routing rules and the way British Airways charges for rewards, it is best to simply search one leg at a time to find availability. The search result screen will show a row of dates around the day you selected. This is an easy way to navigate around in the event you can't find a reward on your ideal date. Also at the top is a selection to find availability with British Airways on other dates link. This brings up a calendar that shows availability, but only on British Airways flight numbers. The calendar shows peak and off peak days as well as days when no reward flights are available. However doing a search on that day shows a different class available on British Airways as well as plenty of Oneworld carrier availability. Always "Search and Book" the days you want. Flight Finder is located on the Reward availability page which can be accessed on the initial page for Spending Avios. The Explorer Map selection does not work for North American users. Search and Book checks all availability for specific dates. If you want to explore possibilities Reward Flight Finder might be a good way. This tool spans a period of time, months up to a year to seek out reward availability. However there are three limitations. It is limited to British Airways flights. Direct flights (no connections). Since all British Airways flights from North American are to London you can't compare destinations. Is specific to the class of service selected. For business or first you would need to do two searches as you would with economy and premium economy. However for direct flights to London this is a great tool to see the possibilities. And if you want to search from London you can search 3 cities at a time. To find world-wide routes you can use the Oneworld Interactive Network Map. Reward inventory on BA.com is very accurate for all Oneworld partners. Where on American you can't search for Cathay Pacific or Japan Airlines, among others, you can find these rewards on BA.com. If you are using Avios for your flights, be sure to use the Search and Book feature as Flight Finder won't get you all Oneworld carriers. All Oneworld carriers should appear on searches when available. British Airways partners of Aer Lingus and Alaska airlines are not found on web searches. You must contact their call center for these carriers. Off-Peak rewards can save on redemption costs, especially long haul economy rewards. British Airways is quite generous assigning off-peak dates. Instead of blocking periods of time, like summer months out completely, they still include at least a few days for off-peak travel most weeks. Typically Tuesday and Wednesday are off-peak days which is a good time to plan your reward travel anyway. Reward Flight Savers were desinged to take the sting out of paying taxes and fees on short haul routes in Europe and Africa. Short haul is considered routes under 2,000 miles. A Reward Flight Saver allows you to pay the normal Avios redemption and £35 (About $45USD) for economy and £50 (about $65USD) for business instead of the standard taxes and fees. Southern Africa flights are £56 ($74$USD) economy and £64 ($85USD) for business. Being interested in a South African flight from Cape Town to Johannesburg I looked had previously looked at this reward. In order to qualify for Reward Flight Savers you must have earned at least 1 Avios for the option to appear on a search. I did not have 1 Avios. Yet my search returned an economy off peak for 6,500 avios and $80 and a business class reward for 12,750 Avios and $80. So there was no cash savings for the South African flight from a regular reward to a Reward Flight Saver, in fact it costs $5 more for business class. Due to the significant surcharges imposed on the vast majority of long haul rewards using Avios, the best use for them is on short distance flights, either in North American on American or in Europe assuming the fees don't engulf the savings. Potentially you can use them is South America as well. As indicated earlier the North American rewards have been devalued in 2016 so they aren't as good as they were. Yet you might find some decent uses as American doesn't have surcharges on domestic flights. Comparing them to what American charges for the same flights you have 2 zones that can save you points. Both are in economy with distances from 651 to 2,000 miles. A trip from New York to Miami, two American hubs is 1,089 miles so only 7,500 Avios which is great. 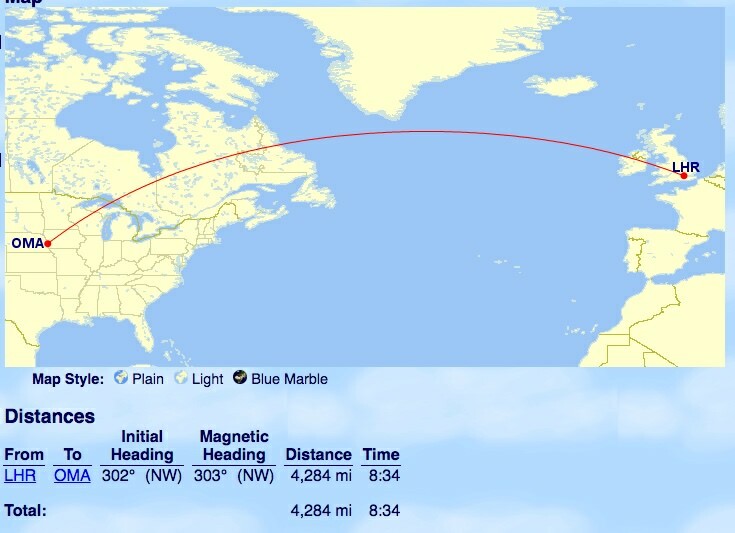 Even Miami to Dallas comes in at 1,121 miles for 7,500 Avios. But if you add connections you'll be above. The American rewards are inside the US 48, while you can use the BA rewards to Canada. An example of Chicago to Vancouver is 1,764 miles or 10,000 BA Avios yet would cost you 15,000 American points. First class is priced out of the equation using Avios. Using the multi-carrier Oneworld chart it's possible to find some excellent rewards for long haul travel. Total the miles of each flight to arrive at the redemption cost. Using this itinerary as an example; Los Angeles to Tokyo (Japan Airlines), Tokyo to Hong Kong (Cathay Pacific), Hong Kong to Doha (Cathay or Qatar), Doha to London (Qatar), London to Los Angeles (American) is a route covering 19.925 miles. In economy it costs 100,000 Avios, Business 200,000 Avios and First 300,000 Avios. This table shows the itinerary using the standard British Airways chart. Since it's 5 flights the comparison is using Peak rates. For the premium classes however, using Off-Peak rates still would be more expensive. The table shows how you can save 90,000 Avios in business and 100,000 Avios in first class flying multiple Oneworld carriers. The British Airways upgrade process is quite easy. When booking a reward ticket you also have the option to book and upgrade. One class upgrades are only allowed and only the lowest economy fares are ineligible (Q,C,G). However the cabin you are upgrading to must have availability. A valuation of 3 cents for each Avios was used based on the fact you can book Avios and Cash which valued Avios at 2.8 - 3.2 cents. In addition, while you can buy AMEX Membership Rewards points for 2.5 cents, they are a 5-4 transfer making them cost 3.3 cents. In all cases in this example upgrading was a better choice than purchasing the ticket. The savings were the greatest for Premium Economy to Business class, saving $5,030 over the published fare. However these fares are significant, business class is $7,753, so while it looks good, would you spend $7,753 for this ticket? Looking at the cost in terms of getting a reward outright appears to be a significantly better deal. Even if you are short Avios, with the Avios and Cash option allowing you to buy up to 50% of the total required, and including the surcharges, this is a less expensive option. You would save $1,193 for a Premium Economy seat if you got the full reward at 26,000 Avios and paid the $256 taxes as opposed to buying and upgrading. However this is one example and based on a one-way fare. It is always important to examine your particular situation. Yet it appears outright reward tickets are the better option. You can also upgrade on American Airlines flights using Avios. While American does not have premium economy at this time (soon), you can upgrade from regular economy to business. Yet I was unable to find a details as to the cost of upgrading AA flights. Searching for them however showed BA charges more. In this route the charge was 40,000 Avios from economy to business where normally it would be 37,000 Avios. For first class upgrades it was 20,000 Avios, an increase of 2,000 over a British Airways upgrade. Avios earnings are based on mileage flown where you get a multiple based on your fare class. Additionally there is a minimum amount received for each level. Points that count towards status on British Airways are also mileage and fare based but have a different multiplier. British Airways has a calculator that can be found here. You can also earn your points from British Airways flights on other Oneworld carriers or BA Partners if you choose. (As well as you can earn Avios when flying on the other carrier if you choose.) Earn carrier has their own calculation for the points. Find the airline on this page and click on their link to see how much you'd earn. British Airways has a U.S. based branded credit cars, the British Airways Visa Signature, offered by Chase Bank. You can earn an Avios bonus after approval along with 3 Avios for every dollar spent with British Airways and Iberia. To apply for the card click here. You can transfer points from other programs to Avios. Chase Ultimate Rewards, AMEX Membership Rewards and Starwood Preferred Guest all transfer to British Airways. In addition there are a number of hotel chains that allows transfers to Avios. If you are going to collect Avios then you can credit most hotel chains as well as Avis car rentals for Avios points. There is a dedicated website for Avios at Avios.com where you can find some local ways to earn Avios in London as well as learn about other ways to earn Avios. Avios are interchangeable between this site, British Airways and Iberia and they are instant transfers. Book your hotel on these portals and get Avios points. You may purchase up to 35,000 Avios in a calendar year. Purchases must be made in increments of 1,000. Be sure to get the best price. Buying only 1,000 will set you back 5.8 cents per Avios while buying over 10,000 the cost is reduced to 3 cents or less. Also if you need Avios the Avios plus Money option where you can buy up to 50% of the required Avios for a reward ticket is probably the better option. Avios's expire if they have the account has not been used in 3 years. While the British Airways program has a number of positives, the requirement to pay all surcharges makes most reward opportunities non-competitive when stacked up against other programs. The issue isn't necessarily with the surcharges, it's that fact that the points required for the reward in the first place are at the high end. Compared to other Oneworld carriers they charge equal if not more for the same routes plus the surcharge (with an arguable inferior product). If they charged 10% or 20% fewer points and added the surcharges then you could consider the positives, like good reward availability. If you have Avios it makes sense to look at a transfer to Iberia.